Figure 1. Constant-Q scans (Q = 1.5 Å) measured on CeRu2Al10 powder as a function of temperature, showing a broad excitation peak around 8 meV in the ordered state below T0 = 27 K, whose spectral weight transfers to a quasielastic signal in the paramagnetic state. Right frames (top to bottom): energy, full width at half maximum, and peak intensity of the inelastic peak. From Ref. .
4f electrons are known to be more localized than d electrons and subject to strong spin-orbit coupling. Instabilities of otherwise magnetic 4f states occur mainly in metallic compounds as a result of hybrid­ization with conduction band states, as described in the well-known Anderson model. This approach basically describes a competition between exchange interactions and Kondo-type magnetic fluctua­tions, producing renormalized Fermi-liquid quasiparticle states, heavy effective masses and, in some cases, “heavy-fermion superconductivity”. Some materials do not fit into this framework, however, because other degrees of freedom (such as the multipole moments) are involved, or because the renormalization leads to a semiconducting ground state (“Kondo insulators”). compositions, whose relative stability ranges can be traced back to the interplay between multipole interactions of different orders and symmetries ,. Recently a new material, CeRu2Al10, became the focus of considerable attention: despite being a seemingly innocuous intermetallic Ce compound, it appears to be on the verge of a semiconducting state, which can be stabilized under a moderate pressure of ~ 1 GPa, but subsequently collapses above 3 GPa. This dramatic effect is directly connected to an elusive phase transition occurring at T0 = 27 K, whose order parameter remains controversial. Superstructure satellites were observed in a powder diffraction experiment on G4-1 , and proven to be magnetic (wave vector kAF = [1,0,0]) using neutron polarization analysis on 4F1. However, the simplest antiferromagnetic structure suggested by the neutron measurements fails to explain the recent results from Al NMR. Furthermore, INS data performed on powder (Figure 1.2) indicate that the main peak developing at about 8 meV below T0 has a mixed (magnetic + nuclear) character. This suggests that the transition does not reduce to a conventional antiferromagnetic ordering, and more detailed investigations have been undertaken to clarify this important question. J. Robert, J.-M. Mignot, G. André, T. Nishioka, R. Kobayashi, M. Matsumura, H. Tanida, D. Tanaka, M. Sera, Phys. Rev. B, Rapid Commun. 82, 100404R (2010). “Kondo insulators” (KIs) form a unique class of strongly correlated f-electron compounds, in which the renormalization of electronic states occurring at low temperature causes the opening of a narrow gap in the density of states, rather than an enhancement of Fermi-liquid quasiparticle masses as found in heavy-fermion systems. They are the subject of a long-standing collaboration with the Russian Research Center “Kurchatov Institute” in Moscow. In previous INS studies, the archetype compound YbB12 was shown to develop a peculiar magnetic response in its KI state below T* ≈ 50 K, dominated by a spin gap and three distinct magnetic excitations. The lower peak, in particular, was ascribed to a spin-exciton (in-gap) mode due to antiferromagnetic correlations and mapped out in Q space using both polarized and unpolarized triple-axis measurements. Lutetium dilution experiments subsequently showed that the spin gap opening is not primarily a coherence effect, as assumed in the usual “hybridization-gap” picture, but could reflect the formation of an array of local singlet-states. Recently, substitution of (trivalent) Yb by (tetravalent) Zr was used to probe the contribution of d-electron states to the latter mechanism. The results indicate that, at variance with the Lu case, the spin gap is partially filled, entailing a stronger suppression of the exciton peak than with Lu . Other intriguing aspects of this dodecaborides concern their lattice dynamics. In these materials, the rare-earth ions are rather loosely bound inside a rigid boron network. 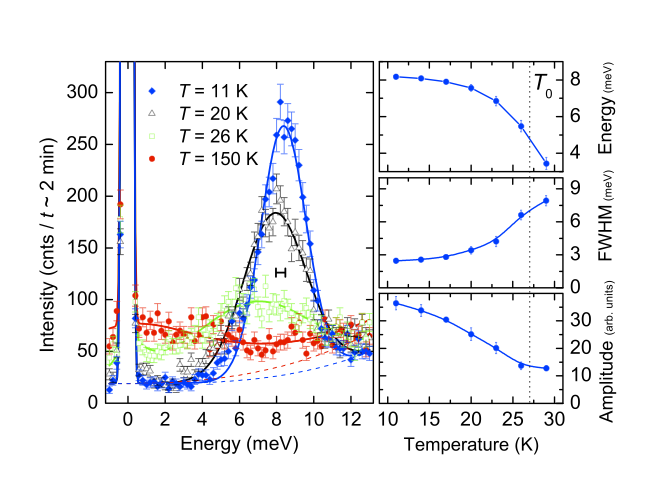 It was shown previously for YbB12 that the phonon modes associated with Yb vibrations occur at an energy close to that of the “exciton” peak, and that their intensity is anomalously enhanced on cooling in the temperature region where KI properties develop. This might result from a coupling between low-energy magnetic and phonon excitations. Recently, ab-initio calculation and INS measurements performed on superconducting ZrB12 revealed that similar “quasilocal” Zr vibration modes exist and make an appreciable contribution to the electron-phonon interactions . They might thus play a role in the rather high transition temperature Tc = 6 K of this compound. K. S. Nemkovski, P. A. Alekseev, J.-M. Mignot, E. A. Goremychkin, A. A. Nikonov, O. E. Parfenov, V. N. Lazukov, N. Yu. Shitsevalova, A. V. Dukhnenko, Phys. Rev. B 81, 125108 (2010). A. V. Rybina, K. S. Nemkovski, P. A. Alekseev, J.-M. Mignot, E. S. Clementyev, M. Johnson, L. Capogna, A. V. Dukhnenko, A. B. Lyashenko, V. B. Filippov, Phy. Rev. B 82, 024302 (2010).